Pluripotent stem cells are increasingly used to build therapeutic models, including the transplantation of neural progenitors derived from human embryonic stem cells (hESCs). Recently, long non-coding RNAs (lncRNAs), including delta-like homolog 1 gene and the type III iodothyronine deiodinase gene (DLK1-DIO3) imprinted locus-derived maternally expressed gene 3 (MEG3), were found to be expressed during neural development. The deregulation of these lncRNAs is associated with various neurological diseases. The imprinted locus DLK1-DIO3 encodes abundant non-coding RNAs (ncRNAs) that are regulated by differential methylation of the locus. We aim to study the correlation between the DLK1-DIO3-derived ncRNAs and the capacity of hESCs to differentiate into neural lineages. We classified hESC sublines into MEG3-ON and MEG3-OFF based on the expression levels of MEG3 and its downstream microRNAs as detected by quantitative reverse transcription-polymerase chain reaction (qRT-PCR). A cDNA microarray was used to analyze the gene expression profiles of hESCs. To investigate the capacity of neural differentiation in MEG3-ON and MEG3-OFF hESCs, we performed neural lineage differentiation followed by neural lineage marker expression and neurite formation analyses via qRT-PCR and immunocytochemistry, respectively. MEG3-knockdown via small interfering RNA (siRNA) and small hairpin RNA (shRNA) was used to investigate the potential causative effect of MEG3 in regulating neural lineage-related gene expression. DLK1-DIO3-derived ncRNAs were repressed in MEG3-OFF hESCs compared with those in the MEG3-ON hESCs. The transcriptome profile indicated that many genes related to nervous system development and neural-type tumors were differentially expressed in MEG3-OFF hESCs. Three independent MEG3-knockdown assays using different siRNA and shRNA constructs consistently resulted in downregulation of some neural lineage genes. Lower expression levels of stage-specific neural lineage markers and reduced neurite formation were observed in neural lineage-like cells derived from MEG3-OFF-associated hESCs compared with those in the MEG3-ON groups at the same time points after differentiation. Repression of ncRNAs derived from the DLK1-DIO3 imprinted locus is associated with reduced neural lineage differentiation potential in hESCs. Pluripotent stem cells are increasingly used for therapeutic models, including the transplantation of neural progenitors derived from human embryonic stem cells (hESCs) . Pluripotent stem cells represent a potential therapy for neurological disorders . Improving the effectiveness of hESC-derived neural precursor transplantation therapies has been widely studied . However, teratoma or tumor formation after transplantation remains a major safety concern . Long non-coding RNAs (lncRNAs), defined as longer than 200 nucleotides in length, are suggested to be involved in neural developmental events [5, 6] and in neurological degenerative diseases [7, 8]. Thus, lncRNAs may play important roles in deriving neural lineage cells from hESCs. Recently, abundant expression of an lncRNA, maternally expressed gene 3 (Meg3), which is also called gene trap locus 2 (Gtl2), was detected in the mouse nervous system. Meg3 is expressed in the forebrain in both developing and adult mice  as well as in developing corticospinal neurons . This lncRNA is derived from the delta-like homolog 1 gene and the type III iodothyronine deiodinase gene (Dlk1-Dio3) imprinted locus, which expresses many non-coding RNAs (ncRNAs) from the maternal chromosome, including the lncRNAs Meg3/MEG3, Rian/MEG8, and Mirg; one C/D box small nucleolar RNA gene cluster; and microRNA (miRNA) clusters. In contrast, three protein-coding genes, Dlk1, Rtl1, and Dio3, are expressed from the paternal chromosome. The correct expression dosages of these ncRNAs and genes are regulated by the two differentially methylated regions of the locus, including the intergenic differentially methylated region (IG-DMR) and the Meg3/MEG3 DMR [11–13]. Differential methylation of this imprinted locus is required for maintaining the full developmental potential of mouse-induced pluripotent stem cells (miPSCs) [14–16]. Humans possessing imprinting defects in the DLK1-DIO3 locus suffer from skeletal malformations, developmental delay/mental retardation, tumor development, and even postnatal death [17–24]. Moreover, ncRNAs derived from the DLK1-DIO3 locus are associated with neurodevelopmental and neurodegenerative disorders. For example, more than 85% of DLK1-DIO3 locus-derived miRNAs are downregulated in patients with schizophrenia , and decreased lncRNA MEG3 expression occurs in patients with Huntington’s disease . Recently, DLK1-DIO3 locus-derived lncRNAs were suggested to associate with polycomb repressive complex 2 (PRC2) and to affect genome-wide PRC2 targets in trans in mouse embryonic stem cells (mESCs) and human induced pluripotent stem cells (hiPSCs) . PRC2 introduces the specific repressive histone marker H3K27me3 to target regions and suppresses gene expression [27, 28]. Most PRC2 target genes are known for their important roles in developmental processes . To study the correlations between the DLK1-DIO3-derived ncRNAs and the differentiation capacity of hESCs toward neural lineages, we classified hESCs into MEG3-ON and MEG3-OFF on the basis of the expression of MEG3 and its downstream miRNAs. We found that using hESCs with repressed DLK1-DIO3-derived ncRNA expression for neural lineage differentiation produced reduced neural lineage marker expression at different stages and reduced neurite formation. This study included the use of human pluripotent stem cells. The derivation of these cell lines and their use in this particular study were approved by the ethics committee of National Taiwan University Hospital and the Internal Research Board of Academia Sinica. Written informed consent was obtained from all subjects involved in this study. The NTU1, NTU3, and H9 hESC lines [29–31] and hiPSC lines [32, 33] were used in this study. These pluripotent stem cells were maintained on murine embryonic fibroblast (MEF) feeders by using serum-free medium (ReproCELL primate and human ESC culture medium; ReproCELL, Kanagawa, Japan). The hESCs were passaged once per week by using a 30-gauge insulin needle or using dispase and collagenase type IV (Gibco, part of Invitrogen, Carlsbad, CA, USA). At 48 hours after passaging, hESC colonies were observed. The medium was refreshed every day. For embryoid body (EB) formation, the hESCs were cultured in suspension in Petri dishes for 5 or 12 days, in accordance with a previously published protocol . On days 5 and 12, EBs were collected for quantitative reverse transcription-polymerase chain reaction (qRT-PCR). The diameters of EBs were quantified by using QCapture Pro 6.0 software (QImaging, Surrey, BC, Canada). qRT-PCR was used to quantify relative mRNA levels in the undifferentiated hESCs, EBs, and neural lineage-like cells. Briefly, at a predetermined time point, cells were collected and treated with TRIzol® (Invitrogen) to extract RNA, and samples of cDNA were obtained by using random hexamer primers following the Superscript III kit protocol (Invitrogen). We detected the expression levels of MEG3 and MEG8 in hESCs by using the SYBR Green PCR master mix (Kapa Biosystems, Wilmington, MA, USA). PCR was performed in a thermal cycler (LightCycler® 480 II Instrument; Roche, Basel, Switzerland) by using the following program: 50°C for 2 minutes, 95°C for 10 minutes, and 45 cycles of denaturation at 95°C for 15 seconds and annealing and extension at 60°C for 45 seconds. The quantitation of the endoderm, mesoderm, and ectoderm layer-specific transcripts, SOX17, HAND1, and PAX6, respectively, were measured during EB formation by qRT-PCR. The expression levels of neural lineage differentiation-associated genes, which included PAX6, RTN1, DLK1, SOX11, beta-III TUBULIN, and MAP2, were detected in MEG3-ON and MEG3-OFF hESCs and their differentiated neural lineage-like cells by using the SYBR Green PCR master mix (Kapa Biosystems). The housekeeping gene GAPDH was used as a normalization control. The 2−ΔΔCp method was used to quantify the qRT-PCR results. The primer sequences are listed in Additional file 1: Table S1. qRT-PCR results demonstrating consistently detectable and specific signals were presented in the bar charts and subject to statistical analysis. N.D. (not detectable) indicates that the expression of a particular gene in certain samples, if any, was below the sensitivity threshold of qRT-PCR analysis. The UPL probe system (Roche) was used to detect the expression of miRNAs, including miR-127-3p, miR-376c, miR-494, miR-495, miR-496, and miR-154. The miRNA detection protocol was based on a previous protocol . PCR was performed in a thermal cycler (LightCycler® 480 II Instrument; Roche). Briefly, a sequence-specific RT primer was used for cDNA synthesis of a specific miRNA in the RT step. Next, a sequence-specific forward primer, a universal reverse primer, and UPL probe 21 were used for amplifying the cDNA. RNU48 was used as an internal control to normalize the miRNA expression levels. The 2−ΔΔCp method was used to quantify the qRT-PCR results. The primer sequences are listed in Additional file 1: Table S1. We collected and classified NTU1 hESCs into four MEG3-ON sublines (NTU 1–1, 1–2, 1–3 and 1–4) and five MEG3-OFF sublines (NTU 1–5, 1–6, 1–7, 1–8, and 1–9) on the basis of the MEG3 expression levels determined by qRT-PCR. We also validated the methylation patterns of the DLK1-DIO3 locus by bisulfite sequencing. H9 hESCs and EBs were used as positive and negative controls of pluripotency, respectively, for the PluriTest assay but were not used for identifying genes with differential expression between the MEG3-ON and MEG3-OFF groups. Total RNA was extracted by using TRIzol® reagent (Invitrogen) and purified by using RNeasy® mini kits (Qiagen, Venlo, Limburg, The Netherlands) to obtain 2 μg of RNA. Concentration and quality were assessed by using an electrophoresis bioanalyzer instrument (Agilent Technologies, Santa Clara, CA, USA). The HumanHT-12 version 4.0 Expression BeadChip (Illumina, San Diego, CA, USA) was used on the basis of its up-to-date content derived from the National Center for Biotechnology Information Reference Sequence (NCBI RefSeq) database (Build 36.2, Release 22). Biotin-labeled cRNA prepared from 1.5 μg of RNA from each sample was fragmented, hybridized to individual HT-12 version 4.0 Expression BeadChips by using the direct hybridization assay protocol, and scanned by using a BeadArray Reader (Illumina). Raw idat microarray files were read into Partek Genomics Suite version 6.5 (Partek, St. Louis, MO, USA) to generate log transformation and quantile normalization. Quality assessment for each array data was also validated by using Partek or R through data distribution and principal component analysis of samples. In total, 47,319 of the 48,206 probe sets were mapped to 21,777 genes, and 14,235 genes had more than one representative probe set. For each redundancy, the probe set with the greatest average expression across all samples was chosen to represent each gene. To identify the most significantly differentially expressed genes (DEGs) between MEG3-ON and MEG3-OFF hESCs, we selected only the DEGs identified by the following criterion: (i) genes with more than 1.5 times fold change between MEG3-ON and MEG3-OFF and with significant differential expression value (P <0.05) based on Welch’s t test (307 genes). (ii) We used the same package in the Bioconductor software package  to perform significance analysis of microarray (SAM)  analysis for comparisons between two groups (MEG3-ON and MEG3-OFF) with 1,000 permutations. In total, 314 significant genes with false discovery rate (FDR) of less than 0.05 and d of 1.68 were selected. On the basis of these criteria, among the two gene lists from Welch’s t test (307 genes) and SAM (314 genes), we obtained 114 intersection DEGs for further biological and functional analysis. A hierarchical clustering heatmap of the 114 genes was generated by using ggplot2  packages in the R platform and Euclidean distance and average linkage. We used MetaCore™ software (version 6.18, build 65505) from GeneGo (part of Thomson Reuters, New York, NY, USA) to investigate whether the genes showing differential expression between MEG3-ON and MEG3-OFF hESCs are involved in particular biological processes or diseases. The MetaCore Gene Ontology (GO) biological process or GO disease analysis used the hypergeometric test to select GO biological process gene sets or disease biomarkers enriched in genes that displayed significant differential expression. The P value was calculated by using the right-tailed Fisher’s exact test based on the hypergeometric distribution. The corrected P values were obtained by FDR calculation based on the Benjamini-Hochberg method  of accounting for multiple testing. A background gene list was collected from all 21,777 mapped microarray genes. Gene Set Enrichment Analysis (GSEA) [39, 40] was performed to determine whether the gene expression levels annotated by the GO term (GO:0007399) associated with nervous system development were specifically enriched in the MEG3-ON (NTU 1–1, 1–2, 1–3, and 1–4) or MEG3-OFF (NTU 1–5, 1–6, 1–7, 1–8, and 1–9) hESCs; gene sets were identified in which these genes were enriched, together with an associated P value calculated by permutation testing. Partial genes from the gene sets were listed in the results. FDR and familywise-error rate (FWER) statistical calculations were performed as described by Subramanian et al.. Moreover, the hESC gene sets  were adopted to test whether the gene sets associated with ESCs could be enriched in the differential expression profiles of the MEG3-ON and MEG3-OFF groups. Furthermore, a separate ‘PluriTest’  was applied to evaluate whether the samples possessed or lost pluripotent features by using machine-learning methods. The pluripotency score is a logistic regression model that enables a probability-based choice between the pluripotent and non-pluripotent phenotypic classes based on microarray data. Overall, 12 microarray chips were analyzed in this test—four MEG3-ON hESCs (NTU 1–1, 1–2, 1–3, and 1–4), seven MEG3-OFF hESCs (NTU 1–5, 1–6, 1–7, 1–8, and 1–9), and two H9 hESCs as the pluripotent controls—and one EB was the pluripotency negative control for the PluriTest. The data were deposited in the NCBI Gene Expression Omnibus (GEO) and are accessible through GEO Series accession number GSE58809. hESC maintenance and EB formation were described above in the ‘Human embryonic stem cell culture’ section. For neuroectodermal sphere (NES) formation, 4-day-old EBs were cultured in N2 medium containing Dulbecco’s modified Eagle’s medium/F12, NEAA (1X), L-glutamine (2 mM), N2 supplement (1X), sodium pyruvate (1 mM), and basic fibroblast growth factor (20 ng/mL) (Gibco) for 3 days, followed by Matrigel attachment for 3 or 18 days. Half of the N2 medium was refreshed every 48 hours. Cell differentiation was performed in eight-well chamber slides (Millicell EZ slide; Millipore, Billerica, MA, USA). Cells were fixed with 4% paraformaldehyde for 20 minutes and blocked with 2% bovine serum albumin (BSA)/0.1% Triton X-100 in 1X phosphate-buffered saline (PBS) for 5 to 10 minutes. The cells were incubated with primary antibodies at 4°C for 16 hours in PBS containing 2% BSA. The cells were washed and then incubated with fluorescent secondary antibodies (715-485-150 and 711-485-152; Jackson ImmunoResearch, West Grove, PA, USA) for 1 hour. Immunocytochemistry was also performed by using anti-β-III tubulin (MAB1637; Millipore), anti-MAP2 (GTX111679; GeneTex, Irvine, CA, USA), and anti-Ki67 (ab15580; Abcam, Cambridge, UK) antibodies. Bisulfite modification was performed by using an EZ DNA Methylation Kit (Zymo Research, Irvine, CA, USA) with genomic DNA extracted from hESCs of different passage numbers. PCR amplification was initiated at 95°C for 5 minutes, followed by 40 cycles of 95°C for 30 seconds, 54°C for 45 seconds, and 72°C for 30 seconds. The following primer sequences were adopted from previous reports: H19 and KvDMR [43, 44], IG-DMR and MEG3 DMR , and PEG10 DMR . The amplified products were cloned into the pGEM-T Easy vector (Promega, Madison, WI, USA), and 20 clones from each genomic sample were picked for sequencing. The sequences were analyzed by BiQ Analyzer software , and only non-clonal sequences are presented. Two knockdown construct types were used in this study. (i) Two MEG3-siRNA plasmids with different target sequences and scramble siRNA-GFP plasmids (Abcam Company). The MEG3-siRNA plasmids and their target sequences for MEG3 are as follows: MEG3-451 siRNA-GFP: tgtgttcacctgctagcaaactggagtgt; MEG3-512-siRNA-GFP: actgactctgtcatcacccttatgatgtc. (ii) MEG3-shRNA plasmid with the other target sequence and the scrambled shRNA plasmid (OriGene TR30021). The shRNA plasmid and its target sequences for MEG3 are as follows: TL 320132C MEG3: gagaggttgtttcactggtatctattgca. Packaging, envelope, and siRNA or shRNA plasmids were transfected into 293 T cells to produce lentiviral particles. Harvested media containing lentivirus were concentrated and used to infect hESCs. The following two infection methods were used in these experiments: (i) Harvested media with lentivirus-containing siRNA plasmid were used to infect hESC clumps (50 to 250 cells per clump). (ii) Harvested media with lentivirus-containing shRNA plasmid were used for single-cell infection. The infected hESCs were cultured on feeder cells for 4 days and switched to ESC medium containing puromycin (1 μg/mL) for selection. Antibiotic-selected and GFP-positive hESCs were amplified and harvested for qRT-PCR detection. In most of the experiments using the NTU1 and NTU3 hESC lines, the error bars represent the standard error of the mean (SEM) generated from three biological samples with three technical repeats each. In the experiments using the H9 hESC and hiPSC lines, the error bars represent the SEM generated from one biological sample with three technical repeats. In the MEG3-shRNA knockdown experiments, the error bars represent the SEM generated from one biological sample, with three technical repeats each. Student’s t test was used for calculating P values. *P <0.05 or **P <0.01 was considered to be significant. In the MEG3-siRNA knockdown experiments, the error bars represent the SEM generated from one biological sample with three technical repeats. For multiple-group analysis in the MEG3-siRNA knockdown experiments, we used one-way analysis of variance followed by Dunnett’s multiple comparisons test and statistics via GraphPad Prism 6 software (GraphPad Software, Inc., La Jolla, CA, USA). Significance was assigned at *P <0.05 and **P <0.01. The data analysis for the arrays is described in the ‘Microarray analysis’ subsection. The DLK1-DIO3 imprinted locus is highly conserved between mice and humans (Figure 1A). In this study, we observed that the DLK1-DIO3 imprinted locus was much more susceptible to hypermethylation than other imprinted loci in both hESC lines and hiPSC lines (Additional file 2: Figure S1). Our miRNA expression profile, which was analyzed by using the Nanostring nCounter™ analysis system (Human miRNA Panel version 2) , further confirmed that 37 out of 39 of the most significantly downregulated miRNAs in later-passage hESCs were derived from the DLK1-DIO3 locus (Additional file 3: Table S2). We collected hESCs and detected their expression levels of DLK1-DIO3-derived ncRNAs, including two lncRNAs, MEG3 (Gtl2 in mice) and MEG8 (Rian in mice), and several miRNAs from different regions of this locus (Figure 1A). Based on the qRT-PCR results, the hESCs with higher MEG3 and MEG8 expression were classified as MEG3-ON hESCs, in which several miRNAs from this locus, miR-127-3p, miR-154, miR-376c, miR-494, miR-495, and miR-496, were also abundantly expressed (Figure 1B). In contrast, hESCs sublines in which MEG3 expression was below the detection threshold of qRT-PCR platform, accompanied by significantly reduced expression of downstream MEG8 and miRNAs, were classified as MEG3-OFF hESCs (Figure 1B). The pluripotency profiles displayed no significant differences in pluripotency-associated gene expression levels between these two hESC sublines on the basis of both GSEA and ‘PluriTest’ (Additional file 4: Figure S2). Thus, MEG3-ON and MEG3-OFF hESC sublines can serve as a paired study model to illuminate the potential role of DLK1-DIO3-derived ncRNAs in hESC-associated research and preclinical model. Classification of MEG3 -ON and MEG3 -OFF human embryonic stem cells (hESCs) by detecting the expression of the DLK1-DIO3 locus-derived non-coding RNAs (ncRNAs). (A) The DLK1-DIO3 imprinted locus, which is highly conserved between mice and humans, including clusters of maternally expressed functional ncRNAs, which are marked in red. The human homologs of the Gtl2 and Rian mice genes are MEG3 and MEG8, respectively. Lollipops with closed circles represent methylated CpG regions, and open circles represent unmethylated CpG regions. Mat, maternal chromosome; Pat, paternal chromosome. (B) The hESCs with high expression levels of imprinted long non-coding RNAs (lncRNAs) (MEG3 and MEG8) and of several imprinted microRNAs (miRNAs) from the DLK1-DIO3 locus (miR-127-3p, miR-154, miR-376c, miR-495, miR-494, and miR-496) were classified as MEG3-ON hESCs. The hESCs without detectable MEG3 expression accompanied by significant repression of other ncRNAs from the same locus were classified as MEG3-OFF hESCs. GAPDH was used as an internal control for mRNA expression analysis, and RNU48 was used as an internal control for miRNA expression analysis. The quantitation of lncRNA and miRNA expression was performed by using the 2−ΔΔCp method. Error bars represent the standard error of the mean generated from three biological repeats. **P <0.01 with respective MEG3-ON groups by Student’s t test. DLK1-DIO3, delta-like homolog 1 gene and the type III iodothyronine deiodinase gene; Gtl2, gene trap locus 2; IG-DMR, intergenic differentially methylated region; MEG3, maternally expressed gene 3; N.D., not detectable. To investigate the MEG3-ON and MEG3-OFF hESC differentiation capacities, we began by directly differentiating MEG3-ON and MEG3-OFF NTU1 hESCs into EBs. 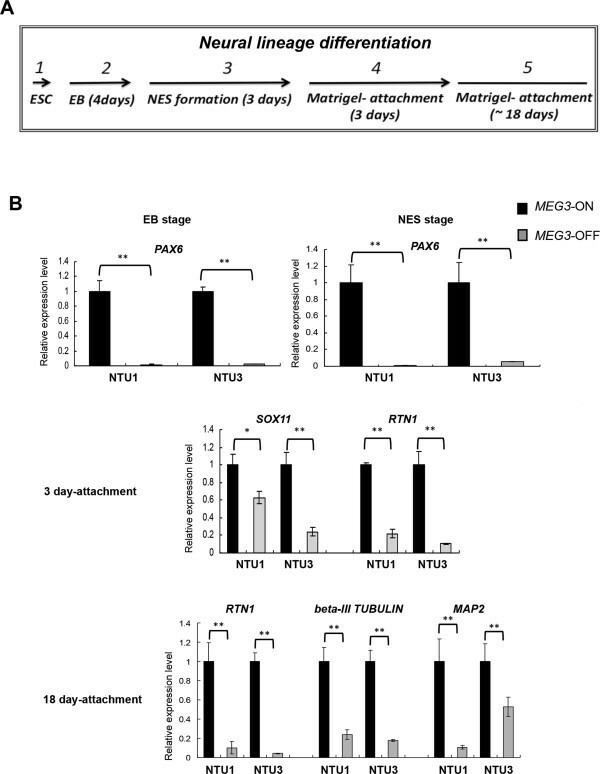 No obvious morphological differences were observed between the undifferentiated MEG3-ON and MEG3-OFF hESCs or between their respective 5-day-old EB derivatives (Figure 2A). However, in prolonged culture up to day 12 after EB formation, the EBs derived from MEG3-OFF hESCs were significantly smaller (P <0.01), and most of these EBs were not well bordered (Figure 2A). Twelve-day-old embryoid bodies (EBs) differentiated from MEG3 -OFF human embryonic stem cells (hESCs) displayed abnormal morphologies and expression levels of developmentally regulated genes. (A) Day 12 EBs that were differentiated from MEG3-OFF NTU1 hESCs were smaller and not well bordered in structure than EBs differentiated from MEG3-ON NTU1 hESCs. Scale bars, 1,000 μm. The bar chart illustrated the differences in diameters of the 12-day-old EBs derived from MEG3-ON and MEG3-OFF hESC sublines. Error bars represent the standard error of the mean (SEM) generated from three biological samples with 20 to 40 EBs in each group. **P <0.01 with respective MEG3-ON groups by Student’s t test. (B) Day 12 EBs differentiated from MEG3-OFF hESCs displayed unusual expression levels of developmentally regulated genes, including higher expression levels of endoderm- and mesoderm-related genes (SOX17 and HAND1, respectively) and low but detectable expression levels of an ectoderm-related gene (PAX6). ‘d’ represents the day of EB formation. GAPDH was used as an internal control for mRNA expression analysis. The quantitation of mRNA expression was performed by using the 2−ΔΔCp method. Error bars represent the SEM generated from three biological samples with three technical repeats each. **P <0.01 compared with the corresponding MEG3-ON groups by Student’s t test. MEG3, maternally expressed gene 3. Moreover, specific markers from the three embryonic germ layers were differentially expressed in 12-day-old EBs (Figure 2B). In MEG3-OFF EBs, the endoderm-specific marker SOX17 and the mesoderm-specific marker HAND1 were overexpressed, whereas the ectoderm-specific marker PAX6, which is also a neural stem cell marker, was only weakly expressed, which may reduce the neural differentiation potential or other differentiation abnormality from MEG3-OFF hESC sublines. To further investigate the cellular properties of MEG3-ON and MEG3-OFF hESCs, we conducted a transcriptome analysis by using cDNA microarrays. We generated a hierarchical clustering heatmap of the 114 genes with significant differential expression between undifferentiated MEG3-ON and MEG3-OFF hESCs. These 114 DEGs were the intersection of the two gene lists analyzed by Welch’s t test (gene selection criteria: P value <0.05 and a fold change >1.5) and by SAM (gene selection criterion: FDR <0.05) (Figure 3A). To further examine whether these DEGs were related to neural lineages, MetaCore GO biological process and GO disease analysis were used to analyze the 114 DEGs. Through the GO biological process analysis, many of the DEGs were classified as developmentally regulated genes belonging to neural lineage differentiation, including genes associated with ‘generation of neurons (GO:0048699; FDR = 1.608 × 10−8)’, ‘neurogenesis (GO:0022008; FDR = 1.608 × 10−8)’, ‘axonogenesis (GO:0007409; FDR = 1.95 × 10−8)’, and ‘neuron differentiation (GO:0030182; FDR = 1.217 × 10−8)’ (Figure 3B, left panel). Through the GO disease analysis, deregulation of these DEGs was correlated with many tumor types, and most of these DEGs were neural lineage-associated tumors (Figure 3B, right panel). In addition, a partial subset of genes classified as ‘nervous system development (GO:0007399; FDR = 0.014, familywise-error rate <0.001)’ by GSEA also showed significant differential expression patterns between the MEG3-ON and MEG3-OFF hESCs (Figure 3C). Among these genes, PAX6 and RTN1 are known for their functions as a neural stem cell marker and as a neuronal differentiation-related gene , respectively (Figure 3C). MEG3 -OFF human embryonic stem cells (hESCs) displayed different transcriptome profiles, particularly in genes related to neural lineage. (A) In total, 114 genes displayed significant differential expression between MEG3-ON and MEG3-OFF hESCs. The embryoid body (EB) sample differentiated from ‘MEG3-ON’ hESCs was used as a reference for differentiated hESCs. The heatmap represents the most significant differentially expressed genes selected by the intersection indicated by Welch’s t test (P <0.05; fold change >1.5) and significance analysis of microarrays (SAM) (false discovery rate <0.05). 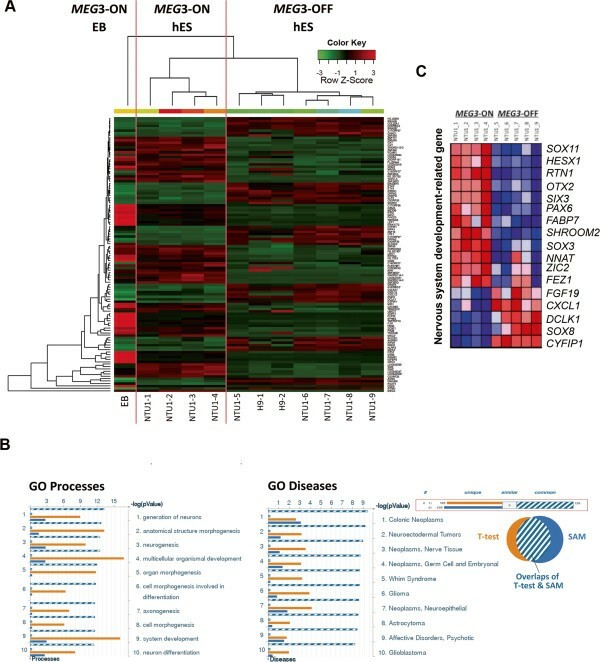 The heatmap displays differentially expressed genes that can be used to distinguish between the MEG3-ON and MEG3-OFF cell states. The green-to-red colors of the heatmap are linearly mapped to the Z-scores, which range from −3 to 3. (B) MEG3-ON and MEG3-OFF hESCs showed differences in the expression levels of many genes that correlate with neural lineage development and with different tumor types. This analysis was performed by using MetaCore software (GeneGo), which includes developmental processes 1,317 Gene Ontology (GO) terms in Biological Process for GO process testing and literature-based biomarkers of clinical diseases for GO disease testing. (C) A partial gene list of subset of genes related to ‘nervous system development (GO:0007399)’ was clearly shown to be differentially expressed between undifferentiated MEG3-ON and MEG3-OFF hESCs by using GSEA. In this heatmap, expression values are represented as colors, with the range of colors (red, pink, light blue, and dark blue) indicating the range of expression values (high, moderate, low, and lowest, respectively). MEG3, maternally expressed gene 3. We validated the association between the levels of MEG3 expression and PAX6 and RTN1 expression by qRT-PCR analysis in paired sublines of three independent hESC lines or in two iPSC lines. 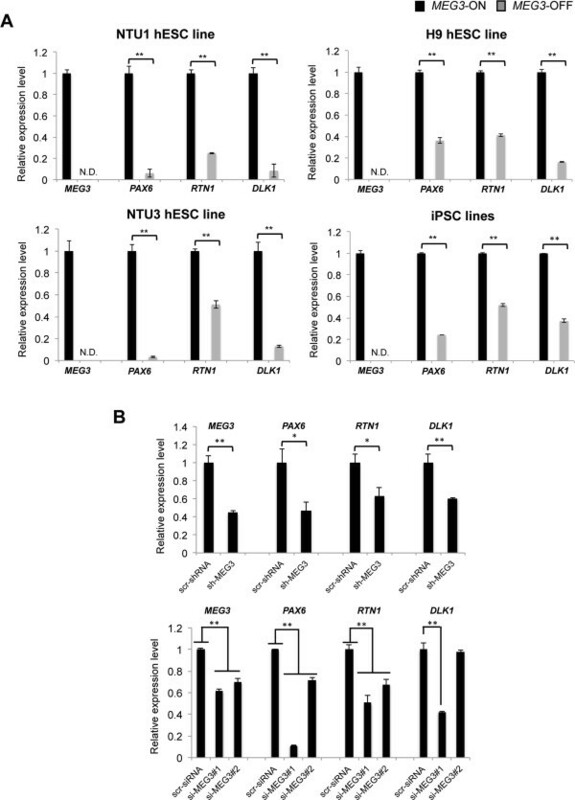 The results indicated that PAX6 and RTN1 displayed reduced expression in each type of MEG3-OFF human pluripotent stem cell line with repressed MEG3 expression (Figure 4A). Moreover, when MEG3 expression was reduced in NTU1 hESCs by knockdown via either shRNA or siRNA, PAX6 and RTN1 were also downregulated (Figure 4B), suggesting that MEG3 may directly or indirectly regulate the expression of these genes in hESCs. Associations between the expression of MEG3 and neural lineage genes in human embryonic stem cell (hESC) and human induced pluripotent stem cell (hiPSC) lines. (A) Repression of MEG3 was consistently correlated with downregulation of PAX6, RTN1, and DLK1 in various cell lines. The cell lines where MEG3 was not detectable, including NTU1, NTU3, H9, and iPSC lines, also displayed lower expression levels of PAX6, RTN1, and DLK1. The mRNA expression was quantified with the 2−ΔΔCp method (using GAPDH for normalization). In the NTU1 and NTU3 hESC lines, error bars represent the standard error of the mean (SEM) generated from three biological repeats. In the H9 hESC line and the two iPSC lines, error bars represent the SEM generated from one biological sample with three technical repeats. *P <0.05, **P <0.01 with the corresponding MEG3-ON groups by Student’s t test. N.D., not detectable. (B) MEG3 knockdown assays were conducted via small hairpin RNA (shRNA) and small interfering RNA (siRNA) to examine the association between MEG3 reduction and the expression levels of neural lineage-related genes in NTU1 hESCs. In the sh-MEG3 group with MEG3 reduction, PAX6, RTN1, and DLK1 showed downregulated expression (upper panel) compared with the scramble control. PAX6 and RTN1 were also downregulated in two si-MEG3-treated groups with reduced MEG3 expression, whereas DLK1 was reduced in one siRNA-treated group compared with the scramble control (lower panel). The mRNA expression was quantified with the 2−ΔΔCp method (using GAPDH for normalization). Error bars represent the SEM generated from one biological sample with three technical repeats each. *P <0.05, **P <0.01 with the corresponding scramble control groups by Student’s t test in shRNA experiments; one-way analysis of variance and Dunnett’s multiple comparisons test were used in siRNA experiments, with significance defined as *P <0.05 and **P <0.01. MEG3, maternally expressed gene 3. Intriguingly, the DLK1 gene, which is a paternally expressed gene from the same imprinted locus, also showed decreased expression in pluripotent stem cells with repressed MEG3 expression, in contrast to the expected reciprocal regulation of these two genes (Figure 4A). A DLK1 function related to neural lineage differentiation was recently observed in mouse and human ESCs . Notably, DLK1 was also downregulated in two out of three independent MEG3 knockdown lines: one si-MEG3 line and one sh-MEG3 line (Figure 4B). When the two si-MEG3-treated hESC lines were compared, the cell line associated with reduced DLK1 expression was shown to be associated with obvious further PAX6 downregulation, suggesting that DLK1 deregulation may be one of the reasons for the reduced expression of these neural lineage-promoting genes (PAX6 and RTN1) in undifferentiated hESCs. MEG3 may be directly involved in regulating PRC2 target genes , which are often developmentally regulated. Some of the neural progenitor markers, PAX6, CXCR4, and SOX21, which were differentially expressed between MEG3-ON and MEG3-OFF NTU1 hESCs, were also PRC2 targets subject to EZH2- and SUZ12-mediated H3K27me3 modification [50, 51] (Additional file 5: Figure S3). Therefore, MEG3 might regulate these neural-progenitor-related genes through a PRC2-mediated mechanism in hESCs. Next, we examined the potential function of ncRNAs derived from the DLK1-DIO3 imprinted locus in neural lineage differentiation in hESCs. We performed in vitro neural lineage differentiation with NTU1 and NTU3 hESC lines (Figure 5A) and investigated the expression levels of several lineage-specific markers, including PAX6, RTN1, SOX11, beta-III Tubulin, and MAP2. At both the EB and the NES stage, the neural stem cell and progenitor cell marker PAX6 was expressed at lower levels in the MEG3-OFF hESC-derived cells (Figure 5B). After 3 days of differentiation on Matrigel, the neuronal precursor and immature neuron marker SOX11 and RTN1 that encodes the neuronal differentiation marker RTN-1C were also expressed at dramatically lower levels in the differentiated cells derived from MEG3-OFF hESCs (Figure 5B). After 18 days of Matrigel attachment, the neuronal and neurite markers beta-III Tubulin, MAP2, and RTN1 were significantly downregulated in the neural lineage-like cells derived from MEG3-OFF hESCs (Figure 5B). Most of these neural progenitor and neuronal markers were expressed at low but detectable levels in MEG3-OFF hESC-derived cells throughout the differentiation process (Additional file 6: Figure S4). This finding also raised the possibility that the neural lineage differentiation rate of MEG3-OFF hESCs might be slower than that of normal hESCs. Furthermore, we analyzed neurite formation capacity by staining with anti-beta-III Tubulin and MAP2 antibodies after 18 days of differentiation on Matrigel (Figure 6). Neural lineage-like cells derived from MEG3-ON hESCs displayed obvious neurite formation at this stage. MEG3-OFF hESC-derived neural lineage-like cells displayed comparatively reduced neurite formation at the same stage, although some cells were positively stained for beta-III Tubulin and MAP2 (Figure 6A and 6B). The percentage of beta-III Tubulin-positive or MAP2-positive cells differentiated from MEG3-OFF hESCs was significantly lower than those from the MEG3-ON hESCs (Additional file 7: Figure S5). The numbers of Ki67-positive-stained cells were not obviously different between the MEG3-ON and MEG3-OFF hESC-derived cells, suggesting those observed differentiation defects seemed not to be linked to the change in cellular proliferation (Additional file 8: Figure S6). Collectively, all of these results suggested that the MEG3-ON hESCs with active expression of ncRNAs derived from the DLK1-DIO3 imprinted locus were associated with a better capacity for neural lineage differentiation. Neural markers were differentially expressed between MEG3 -ON and MEG3 -OFF human embryonic stem cell (hESC)-differentiated cells during neural lineage differentiation. (A) Neural lineage differentiation was conducted from the undifferentiated stage to the 18 day-Matrigel attachment stage in NTU1 and NTU3 hESC lines. (B) Expression levels of stage-specific markers were analyzed by quantitative reverse transcription-polymerase chain reaction in MEG3-ON and MEG3-OFF groups during differentiation. The quantitation of mRNA expression was performed by using the 2−ΔΔCp method (using the housekeeping gene GAPDH for normalization). Error bars represent the standard error of the mean generated from three biological samples with three technical repeats each. *P <0.05, **P <0.01 compared with the respective MEG3-ON groups by Student’s t test. MEG3, maternally expressed gene 3; NES, neuroectodermal sphere. 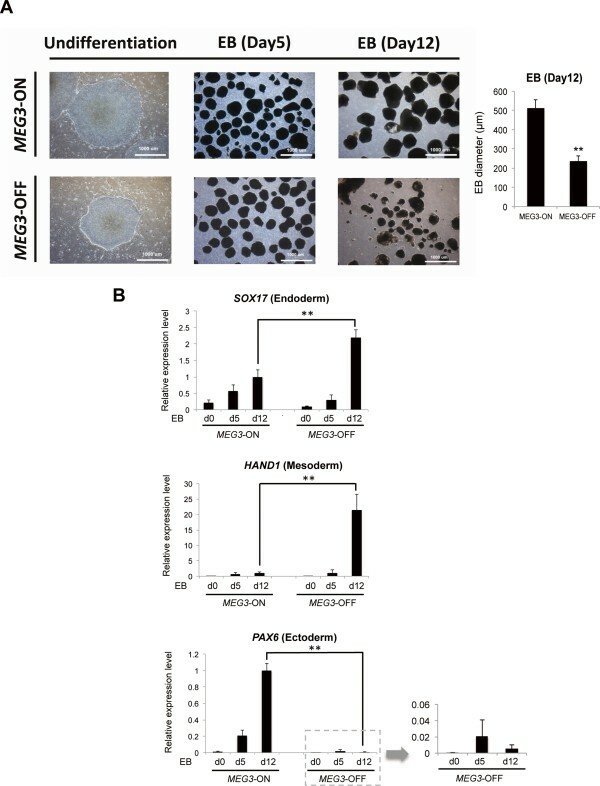 Neurite formation was reduced in MEG3 -OFF human embryonic stem cell (hESC)-differentiated cells compared with cells differentiated from MEG3 -ON hESCs. 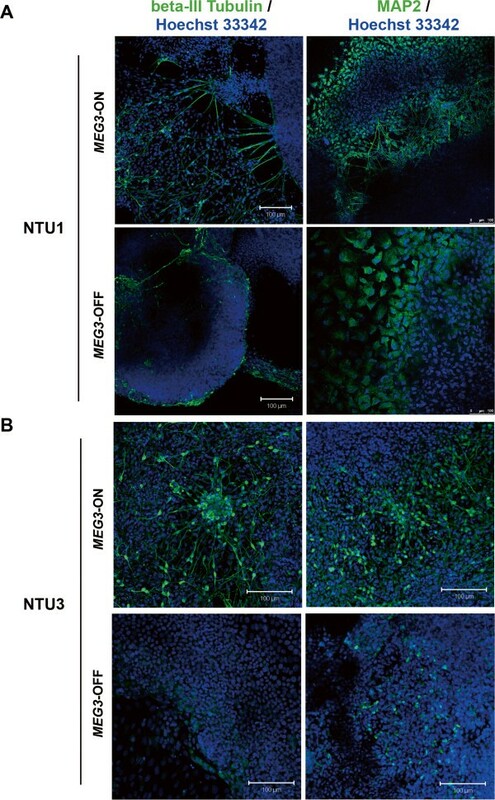 Immunofluorescent staining was performed with anti-beta-III Tubulin and anti-MAP2 antibodies to examine neurite formation in cells derived from MEG3-ON and MEG3-OFF hESCs of the NTU1 (A) and NTU3 (B) cell lines after 18 days of differentiation on Matrigel. Scale bars, 100 μm. MEG3, maternally expressed gene 3. Selecting high-quality hESC lines has been one of the key issues for stem cell-associated studies and therapies. Imprinting instability has long been a problem for medical applications of pluripotent stem cells, including developmental potential and the risk of cancer formation. The maintenance of differential methylation of the DMRs of imprinted loci is required for the correct dosage of imprinted gene expression, which is suggested to be crucial for ESC function [54, 55]. Accumulating evidence suggests that proper imprinting marks on the mouse Dlk1-Dio3 locus are important for the biological functions of miPSCs. Aberrant hypermethylation of the Dlk1-Dio3 locus has been related to the impaired developmental potential of miPSCs. According to the reports by Stadtfeld et al. 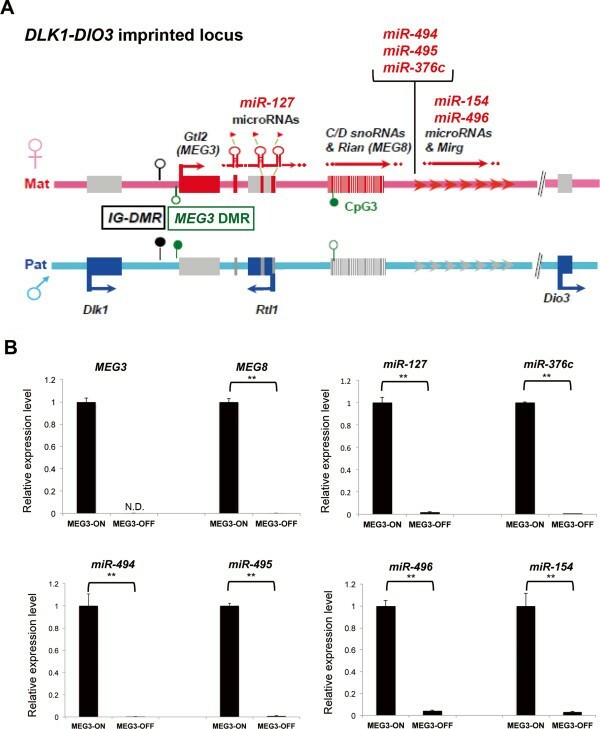 [15, 16] and by Liu et al., Meg3 off miPSCs with an aberrantly hypermethylated Dlk1-Dio3 locus and repressed miRNAs could not achieve full developmental potential for generating full-term mice in a tetraploid complementation assay [14–16]. Ascorbic acid (vitamin C) has been shown to preserve a stable epigenetic state at the mouse Dlk1-Dio3 locus during somatic cell reprogramming for producing miPSC lines, thereby increasing the success rate of embryos reaching full-term development after tetraploid complementation . These studies indicated that ncRNAs derived from the Dlk1-Dio3 locus are required for developmental potential in mouse pluripotent stem cells. Moreover, a study by Stadtfeld et al. demonstrated that the head tissues of Meg3 off embryos derived from a tetraploid complementation assay with Meg3 off miPSCs displayed dramatic repression of three important neural lineage genes, Pax6, Mash-1, and Hes-5. Their data suggested a possible correlation between the ncRNAs derived from the DLK1-DIO3 imprinted locus and the expression levels of neural lineage genes. In the present study, we revealed a positive association between the activities of the DLK1-DIO3 imprinted locus and the differentiation capacity of hESCs for neural lineages on the basis of the following observations: (i) The MEG3-OFF hESCs had reduced potential for differentiating into normal EBs, as evidenced by impaired morphologies and by reduced expression of the ectodermal marker PAX6. (ii) Many genes involved in nervous system development were differentially expressed between MEG3-ON and MEG3-OFF undifferentiated hESCs. (iii) Neural lineage-like cells derived from MEG3-OFF hESCs showed downregulation of neural lineage markers and reduced neurite formation compared with the MEG3-ON groups. None of the above-mentioned studies can exclude the possibility that unidentified genomic regions other than DLK1-DIO3 imprinted locus also acquire aberrant epigenetic marks during iPSC reprogramming or in vitro ESC culture, which accumulatively or independently cause the functional deficiency of these MEG3-OFF-associated pluripotent stem cells. Our MEG3 knockdown experiments induced downregulation of neural lineage markers, suggesting a certain level of potential causative effect between MEG3 expression level and the developmental potential of hESCs. MEG3 and DLK1 have been observed to be reciprocally regulated in mouse embryos . However, how these two genes are regulated in mouse and human pluripotent stem cells is not fully understood. Even in mESC lines in which Meg3 is highly expressed, the expression patterns of Dlk1 are extremely variable . Based on array data, both Meg3 and Dlk1 were shown to be abundantly expressed in one mESC line; however, in three other mESC lines with Meg3 expression, the Dlk1 expression level was shown to be lower . Moreover, Dlk1 expression has also been shown to be low in Meg3 off miPSC lines . In regard to the expression of DLK1 in hESC lines, the array data from another study demonstrated that it was downregulated in most of the tested MEG3-OFF hESC lines . These data imply that the cell type-specific and stage-specific developmental regulation may be the primary factor that controls the net expression level of DLK1 in undifferentiated hESCs. Kaneko et al. did not observe reciprocal correlation of MEG3 and DLK1 expression levels between undifferentiated MEG3 + and MEG3 − hiPSCs identified in their study. They also did not find the differential PRC2 binding on the DLK1 promoter when overexpressing MEG3 in hiPSCs . A DLK1 function related to neural lineage differentiation was recently observed in mESCs and hESCs. DLK1-overexpressing mESCs and hESCs have been shown to promote increased neurogenesis in mESC-derived neural progenitors and hESC-derived neural progenitors, respectively . Interestingly, in our study, the MEG3-ON hESCs with increased capacity for neural lineage differentiation displayed relatively higher DLK1 expression levels compared with the MEG3-OFF hESCs. Our study is the first to link these associations between MEG3 and DLK1 expression with the capacity for neural lineage differentiation in hESCs. Although MEG3 and DLK1 are reciprocally regulated in E16.6 full mouse embryos by parental origin-specific methylation of their imprinting control region , in many mouse pluripotent stem cell lines and hESC lines, including the cells lines in our study, lower MEG3 expression is surprisingly associated with lower expression of DLK1. Because imprinting instability is a frequent phenomenon in in vitro culture systems of mouse and human pluripotent stem cells, this finding raises the possibility that amplification of epigenetic abnormalities might be easily observed in in vitro culture conditions. We speculate that when maternally expressed ncRNAs derived from the DLK1-DIO3 locus are silenced, the deregulation of miRNAs from the same locus might affect other downstream factors, including certain epigenetic modifiers. Consistent with this hypothesis, we previously detected a dramatic increase in H3K9me3 and a decrease in H3K4me3 in total protein levels in NTU1 MEG3-OFF hESCs (data not shown). These results suggest that the global chromatin state in this cell type may be more condensed, which may further affect the deregulation of genes related to MEG3 expression levels found in our study, including the DLK1 gene. The lncRNA MEG3 derived from the DLK1-DIO3 locus possesses tumor suppressor properties in several cancer types, many of which are associated with the nervous system, including pituitary tumors , neuroblastomas , meningiomas , and gliomas . MEG3 expression is significantly decreased in tumor tissues compared with adjacent normal tissues. MEG3 overexpression has been shown to promote cell apoptosis in glioma cell lines and inhibit cell proliferation in glioma and meningioma cell lines [21, 58]. We observed that many genes related to various cancer types, primarily those associated with the nervous system, were deregulated in the MEG3-OFF hESCs in which MEG3 and the other downstream ncRNAs were repressed. Therefore, avoiding the use of MEG3-OFF hESCs may reduce the potential risk of tumorigenesis from stem cell-based therapies. Notably, the RTN1 gene, which is correlated with several neural lineage-type tumors, was dramatically downregulated in MEG3-OFF hESCs and in their neural lineage-like derivatives. The RTN1 gene encodes the RTN1C protein, which is a marker of neuronal differentiation and is known to be downregulated in patients with Alzheimer’s disease and Down syndrome . RTN1C can induce cell apoptosis in neuroectodermal tumors and may be a potential molecular target for therapy . Intriguingly, we observed that RTN1 was downregulated when MEG3 was knocked down, suggesting that MEG3 might participate in the regulation of this gene. Additionally, because MEG3 and RTN1C can induce apoptosis in cancer cells, determining whether RTN1C is regulated by MEG3 in cancer models may be worth further investigation. For basic and preclinical research, choosing hESC lines with higher expression levels of DLK1-DIO3 imprinted locus-derived ncRNAs as starting materials, characterized by the expression of the lncRNA MEG3, may benefit studies of neural lineages. Additionally, screening for MEG3-expressing hESCs may potentially lower the risk of tumorigenesis in stem cell-based therapies. This work was supported by the National Science Council (NSC-100-2321-B-002-074 and NSC 102-2321-B-002-031 for SPL and NSC 100-2321-B-002-072 and NSC 102-2321-B-002-030 for HFC) and the Ministry of Science and Technology (MOST 103-2321-B-002-099 for SPL and MOST 103-2321-B-002-098 for HFC). The funders had no role in the study design, data collection and analysis, decision to publish, or preparation of the manuscript. The authors would like to express their sincere gratitude to Profs. Anne Ferguson-Smith, Jérôme Cavaillé, Chung-Liang Chien, Drs. Petra Hajkova, Joanna Maldonado-Youngson, Neil Youngson, Hung-Fu Liao, and Ms. Ya-Ping Yen for their useful comments during this study and manuscript preparation. We thank Prof. Li-Yu Liu and Dr. Hervé Seitz for their insightful comments regarding the statistical analysis. We thank Ms. Ming-Shan Chiang and Chih-Yun Yu for their excellent technical support. Illumina microarrays were performed by the Yong Ling Biomedical Engineering Center, which is supported by National Taiwan University (http://homepage.ntu.edu.tw/~ntuylbme/geneservice.html). CFM designed and performed experiments, analyzed and interpreted data, and wrote the manuscript. FCW was involved in performing experiments and data analysis. KYT and KWC contributed to microarray data analysis and interpretation. WCC performed the bisulfite-sequencing experiments and analysis. HCK was involved in data analysis and interpretation and contributed experimental materials. HNH contributed to data analysis and interpretation. HFC and SPL were involved in experimental design and in data analysis and interpretation and wrote the manuscript. All authors read and approved the final manuscript.